We've put together a list of questions and responses we're most commonly asked in the lead up to our events. These responses are specific to Dashville Skyline 2016. Alcoholic and non/alcoholic drinks are permitted in the campground but NOT in the arena.Please note, NO GLASS is allowed on to the Dashville property. We do our best to run a bar similar to that of your favourite pub or tavern, so we'd like to encourage you to support the festival by purchasing reasonably priced craft & main stream beers, wine and spirits via our two Dashville Skyline bars. Under-age drinking is also prohibited. Whats the deal with licensing/under 18? The arena is fully licensed, hence the no byo element. Small restrictions apply in the arena because of this. Under 18 are not allowed in the bar service areas. They also must be accompanied/under supervision by an adult for the duration of the event. Likewise with drinks, you can bring your own food into the campground but not into the festival arena. Unfortunately, from Labradors to gold fish, no pets are allowed on to the Dashville property. Obviously assistance animals are an exception. Is there mobile reception/charge station at Dashville? Phone reception for texting and calls is fine at Dashville. But, in regards to the internet on your phone, reception can be a little fussy. However, based on feedback from punters at previous events, internet reception is often available at Dashville. A charge port will be available for phones in the merch barn over the weekend. Can me and my friends get loose? Sure you can, but remember... One of the appealing aspects of our Dashville events is that everyone has a memorable time without impeding on the comfort of others. It’s a spacious property and there’s lots of room to roam. If you and your friends exhibit any aggressive behaviour, or act in a manner genuinely described as “dipshit-like”, you will be escorted from the Dashville property without refund. You will not be allowed to pass “Go” and you will not receive $200. Are you running coaches to Dashville Skyline? 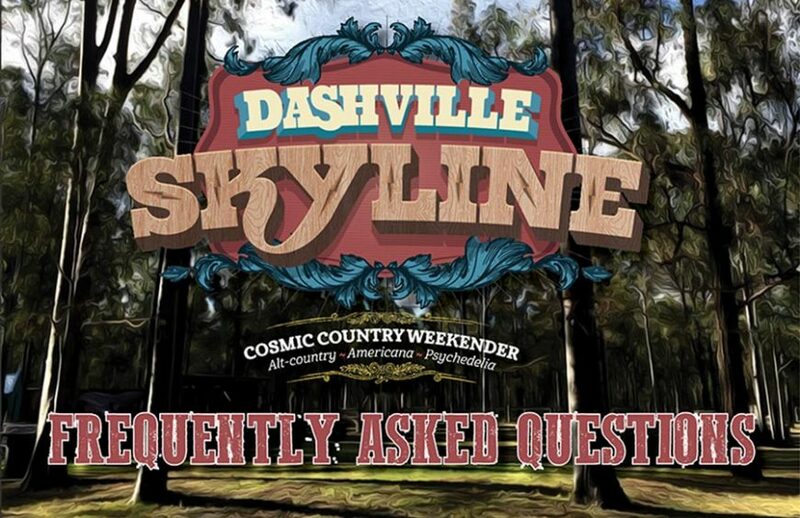 Unlike PigSty in July, Dashville Skyline runs over multiple days. As such, there is not a coach service available. We encourage punters to drive, car pool and, if uncertain, try our breathalyzer test on the way out. Drive safely, folks. Can we bring fireworks or explosives? Absolutely not. We would also prefer it if you didn’t bring fire-twirling sticks and other flammable objects that may damage the property. It’s not that we don’t trust your talents, its more about others who may be young or unaware of the dangers. Then there's also the risk of a bushfire.. Yes, deckchairs and picnic blankets are allowed and encouraged. Umbrellas maybe not so much, but some places towards the back would be ok for it. At this time there is no limit on the size of campervans and caravans. The campground is expansive but is at the mercy of the natural vegetation. If you and your friends have large campervans and would like to be parked next to each other, we recommend getting to Dashville as soon as gates open, as our policy is first-in-best-dressed. No. However, if you have a medical condition that requires powered equipment, please email us on dashville@live.com and we will do our very best to have you connected to power. Small generators are permitted but please be respectful of your fellow patrons in regards to noise. Switch off the genny when others are trying to sleep. If people complain, then it'll need to be turned off. As Dashville Skyline is a celebration of music and culture, campers will inevitably throw on some tunes or play instruments in their respective camp areas. We simply ask that you be respectful and kill the volume at a reasonable hour. At midnight, when the festival’s music finishes, there should be NO music played in the campground, particularly through car stereos and on anything that rhymes with djembe. Yes. All vehicles will be searched by our security staff on the way through Dashville’s main gate. They will mainly be looking for glass, explosives, under age/unaccompanied minors and excessive amounts of alcohol. All gas bottles will be checked by security and must in suitable condition with valid service date to be permitted into campground. All compressed cylinders require responsible use at all times. Can we bring in drugs, weapons and other contraband items? Definitely not. If its illegal in the real world, its generally illegal at Dashville. How can I make my food van or stall a part of Dashville Skyline? The Dashville team welcomes food van and stall submissions. Please head here, fill out the application form and we will be in touch if we think you suit our “cosmic country weekender” vibe. Can my band play at Dashville Skyline? Positions have been filled for this years festival. Generally we do our best to keep a keen eye on artists in Australia and the rest of the world. Many of the artists on the Skyline bill have been invited to play, as we're aware of them and enjoy the music. We do many events and we always consider fresh and upcoming talent for inclusion to our line ups. If you would like to introduce your music to us, you can send an artist/band expression of interest to dashville@live.com or via post to 103 Kirkton Rd Lower Belford 2335. Since we are a year round operation, we may be in touch down the line at any stage once we have your submission. If there is anything unclear or something you are not sure about, please email dashville@live.com for further clarification.